Twitter debuted its new livestream arrive, Periscope earlier this week (or rather, last week). I enjoy all forms of social media but twitter even more than other so I knew I needed to try this new thing out, ASAP. Since then, I have barely been able to put it down! I've stayed up until three in the morning two out of the four days I've had the app, following the lives of a few people in Australia, I've watched as people in the UK and Europe have gone to clubs, walked to work/school, chatting with the audience along the way! I've even opened up my own life and live streamed some random walks through the city, alone and with friends; It's been a blast! I even have a couple regular viewers! I completely understand how this app would not be for everyone but for me, it's gold. The look into the lives of people I'd probably never meet or even be aware of...It allows viewers to see things they'd normally never see. 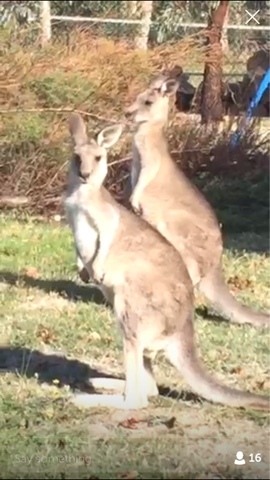 A young man in Melbourne, Australia took us to his backyard where kangaroos were just...well...hanging out! I'll admit, I didn't try Meerkat, a rival streaming app so I have nothing to compare Periscope to. However, my first Periscope feed was Darren Aronofsky visiting the site of the explosion in the East Village and I was hooked.